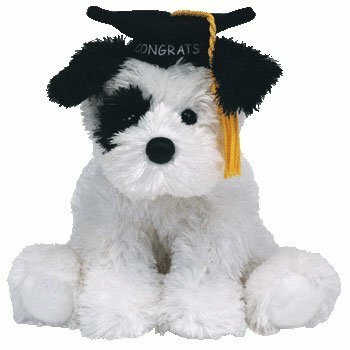 Congrats is made from a scruffy white material with black ears and a black patch over his right eye. He has black button eyes and a black nose. He wears a black graduation hat with a yellow tassel and the word “Congrats” on it in white writing. We wish you Happy Graduation! Congrats was released on 1st April 2009. His birthday is on 29th March 2008. He is a graduation Beanie Baby and was exclusive to Walgreens.